The Nakajima Ki-43 Hayabusa (隼, "Peregrine Falcon") was a single-engine land-based tactical fighter used by the Imperial Japanese Army Air Force in World War II. The army designation was "Army Type 1 Fighter" (一式戦闘機); the Allied reporting name was "Oscar", but it was often called the "Army Zero" by American pilots for its resemblance to the Mitsubishi A6M Zero, which was flown by the Japanese Navy. Like the A6M, the radial-engined Ki-43 was light and easy to fly, and became legendary for its combat performance in East Asia in the early years of the war. It could outmaneuver any opponent, but did not have armor or self-sealing tanks, and its armament was poor until the last version, which was produced as late as 1944. 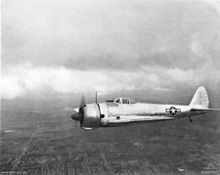 Allied pilots often reported that the nimble Ki-43s were difficult targets, but burned easily or broke apart with few hits. In spite of its drawbacks, the Ki-43 shot down more Allied aircraft than any other Japanese fighter and almost all the JAAF'S aces achieved most of their kills in it. Total production amounted to 5,919 aircraft. Many of these were used during the last months of the war for kamikaze missions against the American fleet. The Ki-43 was designed by Hideo Itokawa, who would later become famous as a pioneer of Japanese rocketry. The Ki-43 prototype was produced in response to a December 1937 specification for a successor to the popular Nakajima Ki-27. The specification called for a top speed of 500 km/h (311 mph), a climb rate of 5,000 m (16,400 ft) in five minutes and a range of 800 km (500 mi). Maneuverability was to be at least good as the Ki-27. When first flown in January 1939, the Ki-43 prototype was a disappointment. Japanese test pilots complained that it was less maneuverable than the Ki-27 and not much faster. In order to solve these problems, Nakajima produced a series of progressively modified prototypes through 1939 and 1940. These changes involved a major weight saving program, a slimmer fuselage with the tail surfaces moved further aft and a new canopy. Crucially, the 11th prototype introduced the unique "butterfly" (or Fowler-type) maneuvering flaps, which dramatically improved performance in tight turns. The 13th prototype combined all these changes, and tests of this aircraft resulted in an instruction for Nakajima to place the Ki-43 into production, the Ki-27 jigs being transferred to the Mansyu factory at Harbin in Japanese occupied Manchukuo. The initial production version was given the designation Ki-43-I. Deliveries from Nakajima's Ota factory commenced in April 1941. In addition to outstanding maneuverability, the Ki-43-I had a very impressive rate of climb due to its light weight. Power was provided by the Nakajima Ha-25 engine turning a two bladed, two-pitch metal propeller. Top speed was 495 km/h (308 mph) at 4,000 m (13,160 ft). The Ki-43 was equipped with two cowling machine guns in various configurations, with either two 7.7 mm (.303 in) Type 97 machine guns, one 12.7 mm (.50 in) Ho-103 machine gun (machine cannon) and one 7.7 mm (.303 in) gun, or two 12.7 mm (.50 in) Ho-103 guns; the aircraft was given various sub-designations to reflect these differences. The configuration that appears to have been most prevalent at the outset of the war was the first configuration with two 7.7 mm (.303 in) Type 97 machine guns, while as the war progressed the heavier combinations gained popularity and the version with the heaviest armament was sometimes given the designation Ki-43-Ic. The Ho-103 was often loaded with explosive ammunition to increase target effect; its penetrative effect against later Allied aircraft armor appears to have been marginal. Prototypes for the Ki-43-II flew in February 1942. The Ha-25 engine was replaced by the more powerful Nakajima Ha-115 engine, which was installed in a longer-chord cowling. The new engine turned a three bladed propeller. The wing structure, which had suffered failures in the Ki-43-I, was strengthened and equipped with racks for drop tanks or bombs. The Ki-43-II was also fitted with 13 mm armor plate for the pilot's head and back, and the aircraft's fuel tanks were coated in rubber to form a crude self-sealing tank. The pilot also enjoyed a slightly taller canopy and a reflector gunsight in place of the earlier telescopic gunsight. Nakajima commenced production of the Ki-43-II at its Ota factory in November 1942. Production was also started at the Tachikawa Hikoki KK and the 1st Army Air Arsenal (Tachikawa Dai-Ichi Rikugun Kokusho), also at Tachikawa. Although Tachikawa Hikoki successfully managed to enter into large scale production of the Ki-43, the 1st Army Air Arsenal was less successful, being hampered by a shortage of skilled workers, being ordered to stop production after 49 Ki-43s were built. Nakajima eventually ceased production in mid-1944 in favor of the Ki-84, but the Tachikawa Hikoki continued to produce the Ki-43. Tachikawa also produced the Ki-43-III, which utilized the more powerful Nakajima Army Type 1 Ha-115-II engine. Maximum speed increased to 358 mph. Tachikawa produced 2124 Ki-43-II and -III aircraft between April 1944 and the end of the war. Total production of all versions amounted to 5,919 aircraft. Picture - A Ki-43 III-Ko, piloted by Second Lieutenant Toshio Anazawa and carrying a 250 kg (550 lb) bomb, sets off from a Japanese airfield for the Okinawa area, on a kamikaze mission, 12 April 1945. School girls wave goodbye in the foreground. 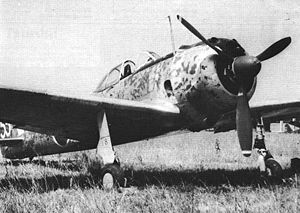 The Ki-43 was the most widely-used Army fighter, and equipped 30 sentai (groups) and 12 chutais (independent squadrons). The first version, Ki-43-I, entered service in 1941, the Ki-43-II in December 1942, the Ki-43-II-Kai in June 1943, and the Ki-43-IIIa in summer 1944. The aircraft fought in China, Burma, the Malay Peninsula, New Guinea, the Philippines, South Pacific islands and the Japanese home islands. Like the Zero, the Ki-43 initially enjoyed air superiority in the skies of Malaya, Netherlands East Indies, Burma and New Guinea. This was partly to do with the better performance of the Oscar and partly due to the relatively small numbers of combat-ready Allied fighters, mostly the P-36 Hawk, Curtiss P-40, Brewster Buffalo, Hawker Hurricane and Curtiss-Wright CW-21 in Asia and the Pacific during the first months of the war. As the war progressed, however, the fighter suffered from the same weaknesses as the Ki-27 "Nate" and the A6M Zero; light armor and less-than-effective self-sealing fuel tanks, which caused high casualties in combat. Its armament of two machine guns also proved inadequate against the more heavily armored Allied aircraft. As newer Allied aircraft were introduced, such as the P-47 Thunderbolt, P-38 Lightning, P-51 Mustang, F4U Corsair, F6F Hellcat and late-model Supermarine Spitfire/Seafire, the Japanese were forced into a defensive war and most aircraft were flown by inexperienced pilots. However, even towards the end, the Oscar's excellent maneuverability could still gain advantage over rash Allied pilots. Like most Japanese combat types, many Hayabusas were at the end expended in kamikaze raids. The Ki-43 also served in an air defense role over Formosa, Okinawa and the Japanese home islands. Some examples were supplied to the pro-Japanese regimes of Thailand, Manchukuo and Wang Jingwei Government as well. The Thai units sometimes fought against the USAAF in southern China. Hayabusas were well liked in the JAAF because of the pleasant flight characteristics and excellent maneuverability, and almost all JAAF fighter aces claimed victories with Hayabusa in some part of their career. 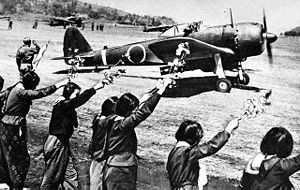 At the end of the war, most Hayabusa units received Ki-84 Hayate "Frank" fighters, but some units flew the Hayabusa to the end of the war. The top-scoring Hayabusa pilot was Sergeant Satoshi Anabuki with 39 confirmed victories, almost all of them scored with the Ki-43. After the war, some captured examples served in limited numbers in the French Air Force in Indochina against Viet Minh rebels. Picture - A captured Ki-43-Ib in flight over Brisbane, 1943. Hayabusa Fighter Type 1 of Army (Mark 1). Variant armed with 20 mm cannons. Advanced interceptor version of Nakajima Ki-43 with a powerful engine and armed with 30 mm (1.18 in) or 40 mm (1.57 in) cannons. Two squadrons operated captured aircraft. Chinese Communist Air Force captured five aircraft in 1946 from nationalists. Aircraft were operated until their retirement in 1952. French Air Force Escadron de Chasse 1/7 operated captured aircraft in 1945-6 Indo-China. Indonesian People's Security Force operated captured aircraft against Dutch colonial rule. On 29 July 1947, Indonesia intended to use a Ki-43 from Maguwo Air Force Base, Yogyakarta for bombing Dutch strategic positions in Ambarawa, Salatiga and Semarang. However, it failed to fly because of mechanical problems. It is currently on display in the Museum Dirgantara Udara Yogyakarta (near Adisucipto International Airport). North Korean Air Force operated captured aircraft after the war. 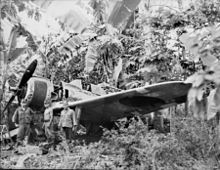 Picture - The Flying Heritage Collection Ki-43 at Rabaul, 1945. Owned by Paul Allen/Flying Heritage Collection, Arlington, Washington, USA. Former ZK-OSC restored to flying condition by the Alpine Fighter Collection in the 1990s, not currently flying. Four aircraft under restoration/rebuild at Texas Airplane Factory, Meacham Field, Fort Worth, Texas, USA. Tillamook Air Museum in Oregon. Bueschel, Richard M. Nakajima Ki-43 Hayabusa I-III in Japanese Army Air Force RTAF-CAF-IPSF Service. Reading, Berkshire, UK: Osprey Publications, 1970. ISBN 0-85045-022-5. Bueschel, Richard M. Nakajima Ki-43 Hayabusa in Japanese Army Air Force RTAF-CAF-IPSF Service. Atglen, PA: Schiffer Books, 1995. ISBN 0-88740-804-4. Dorr, Robert F. and Chris Bishop. Vietnam Air War Debrief. London: Aerospace, 1996. ISBN 1-874023-78-6. Francillon, Ren� J. Japanese Aircraft of the Pacific War. London: Putnam & Company, 1970. ISBN 0-370-00033-1 1979 edition, ISBN 0-370-30251-6. Ethell, L. Jeffrey. Aircraft of World War II. Glasgow: HarperCollins Publishers, 1995. ISBN 0-00-470849-0. Green, William and Gordon Swanborough. WW2 Aircraft Fact Files, Japanese Army Fighters, part 2. London: Macdonald and Janes's, 1977. ISBN 0-354-01068-9. March, Daniel J. and John Heathcott, eds.The Aerospace Encyclopedia of Air Warfare Volume Two: 1945 to the Present. London: AIRtime Publishing, 1997. ISBN 1-87402-388-3. "Pacific Peregrine... The Nakajima Ki.43 Hayabusa". Air International, January 1980, Vol 18 No 1, pp. 27-31, 44 46. Bromley, UK: Fine Scroll. ISSN 0306-5634. Pajdosz, Waldemar, Mark T. Wlodarczyk and Adam Jarski. Nakajima Ki 43 Hayabusa "Oscar" (in Polish), Monografie Lotnicze 48. Gdańsk: AJ-Press, 1998. ISBN 83-86208-97-X. Skulski, Przemysław. Nakajima Ki 43 Hayabusa "Oscar", seria Pod Lupa no.11 (Polish/English). Wrocław: Ace Publications, 1999. ISBN 83-86153-98-9. Stanaway, John. Nakajima Ki.43 "Hayabusa" - Allied Code Name "Oscar". Bennington, VT: Merriam Press, 2003 (2nd expanded edition 2006). ISBN 1-57638-141-2. Windrow, Martin C. and Ren� J. Francillon. The Nakajima Ki-43 Hayabusa. Leatherhead, Surrey, UK: Profile Publications, 1965.